DAP v5.1.2 (beta) and DAP LiveLinks v2.0.5 is now available for download. This release includes Critical Paypal Security updates. We’ve also addressed a few minor DAP v5.1.1 beta issues. Click here to learn more about the updates we’ve made to DAP to beef up security. We expect to make DAP v5.1.2 FINAL in about a week (8/24). If you have a LIVE website with active subscriptions and members, then you might want to hold off on installing DAP v5.1.2 beta until we release the FINAL version in about a week from now. If you’re ready to upgrade your site to DAP v5.1.2 (beta), just open a support ticket and we’ll upgrade DAP and DAP Livelinks plugin on your site. If you’re not a DAP Monthly/Platinum member, you should certainly consider upgrading, and avail of our “no worries, we’ll do it for you” service. Plus you get every single one of our plugins, upgrades & support – all for free! Click HERE to find out more. Download DAP v5.1.2 (beta) and LiveLinks v2.0.5 zip files from your members’ area on our site. You can use the DAP Easy Installer plugin to upgrade DAP to v5.1.2 and LiveLinks to v2.0.5. => Download LiveLinks v2.0.5 zip file from the members’ area on our site, unzip it and upload it to the WP plugins folder on your site (/wp-content/plugins) overwriting the existing DAP-WP-LiveLinks folder. => Download DAP v5.1.2 zip file from the members’ area on our site, unzip it and upload it to the root folder on your site overwriting the existing contents of the “dap” folder on your site. Do NOT delete the “dap” folder. Install the new DAP v5.1.2 BETA & LiveLinks v2.0.5. You can use the DAP Easy Installer plugin (or use regular FTP) to install DAP. If you’ve any questions or concerns about this release, please leave a comment below. We’re super thrilled to announce the BETA release of DAP v5.1.0 ! This release is all about “DAPConnect”! DAPConnect will allow you to connect your favorite apps with DAP in no time! You can connect them directly with DAP or you can connect your apps with DAP using Zapier! Please refer this post to find out more on “DAPConnect” – what it does and how it works. Please note that this is a BETA release of DAP v5.1.0. If you have a LIVE Web Site with active subscriptions and members, then you might want to hold off on installing DAP 5.1.0 BETA until we release the FINAL version in about 2 weeks. If you’re ready to upgrade your site to DAP v5.1.0 (beta), just open a ticket and we’ll upgrade DAP and DAP Livelinks plugin on your site. Download DAP v5.1.0 (beta) and LiveLinks v2.0.3 zip files from your members’ area on our site. a) You can use the DAP Easy Installer plugin to upgrade DAP to v5.1.0 and LiveLinks to v2.0.3. => Download LiveLinks v2.0.3 zip file from the members’ area on our site, unzip it and upload it to the WP plugins folder on your site (/wp-content/plugins) overwriting the existing DAP-WP-LiveLinks folder. => Download DAP v5.1.0 zip file from the members’ area on our site, unzip it and upload it to the root folder on your site overwriting the existing contents of “dap” folder. Install the new DAP v5.1.0 BETA & LiveLinks v2.0.3. You can use the DAP Easy Installer plugin (or use regular FTP) to install DAP. Please be sure to watch the video above to see what DAPConnect is all about, and do leave us a comment behind! DAP v5.0.5 is now officially ‘Final’! 5.0.5 is the latest in the 5.0.x series. It replaces the older versions – 5.0, 5.0.1, 5.0.2 and 5.0.4. DAP v5.0.5 goes together with LiveLinks v2.0.3. DAP 5.0 Release – More intuitive and easier-to-use DAP Admin pages, improved navigation, mobile-responsive interfaces, improved look & feel, and a lot more options to manage and access your membership data. Watch this video for a complete behind the scenes look at the DAP 5.0 features! DAP 5.0.2 Release – Create mobile-responsive and elegant member-facing pages in seconds. Watch this video for a complete behind the scenes look at the DAP 5.0.2 features! DAP 5.0.4 Release – ConvertKit is a rapidly growing Email Marketing Platform that comes with simple, elegant, easy to design templates and great automation capabilities. DAP now has full integration with ConvertKit. DAP v5.0.5 / Livelinks v2.0.3 is now FINAL and can be used on live sites. If you’re ready to upgrade your site to DAP v5.0.5, just open a support ticket and we’ll upgrade DAP and DAP Livelinks plugin on your site. If you don’t find the DAP v5.0.5 and DAP LiveLinks v2.0.3 zip files in your member’s area, it’s probably because your access to DAP Support & Upgrades has expired. We currently have a Great Discount Offer for MULTI-YEAR renewals (along with some AMAZING Bonuses). Click HERE to checkout the discount offer. This renewal offer is valid only for a limited-time so be sure to take advantage of it. If you have made any custom updates to any of the core DAP files directly, then be sure to take a full backup of your DAP and DAP-WP-LiveLinks folder (via ftp) before you upgrade DAP. NOW is a great time to promote DAP as an affiliate! DAP is available for purchase as a subscription. You will earn ongoing lifetime recurring commissions for the subscription signups! You can get your affiliate link from your members area on DigitalAccessPass.com. Download DAP v5.0.5 and LiveLinks v2.0.3 zip files from your members’ area on our site. a) You can use the DAP Easy Installer plugin to upgrade DAP to v5.0.5 and LiveLinks to v2.0.3. => Download LiveLinks v2.0.3 zip file from your members’ area on our site, unzip it and upload it to the WP plugins folder on your site (/wp-content/plugins) overwriting the existing DAP-WP-LiveLinks folder. => Download DAP v5.0.5 zip file from your members’ area on our site, unzip it and upload it to the root folder on your site overwriting the existing contents of “dap” folder. Install the new DAP v5.0.5 BETA & LiveLinks v2.0.3. You can use the DAP Easy Installer plugin (or use regular FTP) to install DAP. Exciting stuff for DAP users! Next we’ll be releasing a full-fledged Zapier integration with DAP that’ll open up DAP like never before – both inbound and outbound! If you use DAP to power your membership site, it’ll open up a world of possibilities and opportunities for YOU because you can feed subscriber data from ANY external system to DAP and you can also get DAP to send out subscriber details to ANY external system of your choice! It could to be your own site, to a partner site or a 3rd party site — and the best part is… you can do all of this with or without Zapier! Imagine the possibilities if you can connect any email marketing platform or any shopping cart platform of your choice to DAP! More to come on that integration very soon! Stay tuned! Please leave your comment below. We look forward to your comment & feedback! P.S. Please do leave us a comment below and let us know what you think. We’re thrilled to announce DAP integration with ConvertKit and also the BETA release of DAP v5.0.4! ConvertKit is a rapidly growing Email Marketing Platform that comes with simple, elegant, easy to design templates and great automation capabilities. It offers the benefits of automation at a lower cost than other advanced automation programs like Infusionsoft or Active Campaign. ConvertKit offers advanced email marketing capabilities without sacrificing ease of use. ConvertKit can tag subscribers and segment your email list based on certain actions your subscribers take, such as signing up from a specific form, downloading or purchasing a certain product, clicking a specific link, etc. Then, you can run campaigns for specific tags. You can also setup followup sequences to trigger certain events. The integration between DAP and ConvertKit is 2-way. DAP leverages the ConvertKit Zap to automatically add subscribers (that signup via a ConvertKit form) to a DAP product. You’ll find the integration details in the video above. You’ll need a Zapier account for this integration. You can use the DAP Products Page => Notifications tab -> Plugin Notification Field to configure DAP to automatically add users to your ConvertKit form with the specified tags. You can also configure DAP to remove tags from the subscriber when they lose access to a product in DAP. DAP also sends membership “password” to ConvertKit so you can use ConvertKit to send out the initial welcome email with membership credentials. You’ll find all the integration details in the video above. Please note that this is a BETA release of DAP v5.0.4. If you have a LIVE Web Site with active subscriptions and members, then hold off on installing DAP 5.0.4 BETA until we release the FINAL version. We hope to make DAP 5.0.x FINAL on May 25th, 2016. If you’re ready to upgrade your site to DAP v5.0.4 (beta), just open a ticket and we’ll upgrade DAP and DAP Livelinks plugin on your site. If you don’t find the DAP v5.0.4 and DAP LiveLinks v2.0.3 zip files in your member’s area, it’s probably because your access to DAP Support & Upgrades has expired. Download DAP v5.0.4 (beta) and LiveLinks v2.0.3 zip files from your members’ area on our site. a) You can use the DAP Easy Installer plugin to upgrade DAP to v5.0.4 and LiveLinks to v2.0.3. => Download DAP v5.0.4 zip file from the members’ area on our site, unzip it and upload it to the root folder on your site overwriting the existing contents of “dap” folder. Install the new DAP v5.0.4 BETA & LiveLinks v2.0.3. You can use the DAP Easy Installer plugin (or use regular FTP) to install DAP. We’re working on several exciting new things that will help you grow your membership site. Zapier integration is one of the most requested integrations by Dappers. You’ll be happy to know that we’ve built an awesome new integration between Zapier & DAP :). This integration will allow you to pretty much integrate any 3rd party system (even if it does not have a built-in ZAP) with DAP. We’re super thrilled to announce the BETA release of DAP v5.0.2 and LiveLinks v2.0.2. In this release, we’ve taken the creation of User-Facing Membership Pages to a whole new level! You can now create mobile-responsive and elegant member-facing pages in a matter of seconds. This release is jam-packed with some amazing new features that will add great value to your membership site. Watch this video for a complete behind the scenes look at the new DAP 5.0.2 features! A must-watch video for all DAP users ! Please note that this is a BETA release of DAP v5.0.2. If you have a LIVE Web Site with active subscriptions and members, then hold off on installing DAP 5.0.2 BETA until we release the FINAL version in about 2 weeks. If you’re ready to upgrade your site to DAP v5.0.2 (beta), just open a ticket and we’ll upgrade DAP and DAP Livelinks plugin on your site. If you don’t find the DAP v5.0.2 and DAP LiveLinks v2.0.2 zip files in your member’s area, it’s probably because your access to DAP Support & Upgrades has expired. DAP v4.9.2 is NOW Final. Download DAP v5.0.2 (beta) and LiveLinks v2.0.2 zip files from your members’ area on our site. a) You can use the DAP Easy Installer plugin to upgrade DAP to v5.0.2 and LiveLinks to v2.0.2. => Download LiveLinks v2.0.2 zip file from the members’ area on our site, unzip it and upload it to the WP plugins folder on your site (/wp-content/plugins) overwriting the existing DAP-WP-LiveLinks folder. => Download DAP v5.0.2 zip file from the members’ area on our site, unzip it and upload it to the root folder on your site overwriting the existing contents of “dap” folder. Install the new DAP v5.0.2 BETA & LiveLinks v2.0.2. You can use the DAP Easy Installer plugin (or use regular FTP) to install DAP. => Email Tracking (opens, clicks, bounces etc) and Reporting. => A new and much improved Shopping Cart featuring: 2-step checkout, build your own checkout form, 1-click upsells, bumps etc. And it won’t cost you a fortune in monthly fees! => Role based Management of DAP Admin Interface. => 2-click Registration using Facebook (no need to enter name, email manually). We are very thankful that you continue to place your trust in us and remain a part of the DAP family! We’ll continue to work very hard to help you achieve greater success with DAP! Please be sure to watch the video above to see what DAP v5.0.2 is all about, and do leave us a comment behind! P.S. It would be amazing if you could leave us a comment below and let us know what you think. We’re super thrilled to announce the BETA release of DAP v5.0 and LiveLinks v2.0. An incredible amount of time and effort went into this one – so we’re really excited about this new release! Our goal with DAP 5.0 is to improve your overall DAP experience with easier-to-use, easy-on- the-eyes and more intuitive DAP Admin pages, improved navigation, mobile-responsive interfaces, improved look &feel, and a lot more options to manage and access your membership data. Watch this video for a complete behind the scenes look at the new DAP 5.0 features! Please note that this is a BETA release of DAP v5.0. If you have a LIVE Web Site with active subscriptions and members, then hold off on installing DAP 5.0 BETA until we release the FINAL version in about 4-6 weeks. If you’re ready to upgrade your site to DAP v5.0 (beta), just open a ticket and we’ll upgrade DAP and DAP Livelinks plugin on your site. If you don’t find the DAP v5.0 and DAP LiveLinks v2.0 zip files in your member’s area, it’s probably because your access to DAP Support & Upgrades has expired. Download DAP v5.0 (beta) and LiveLinks v2.0 zip files from your members’ area on our site. a) You can use the DAP Easy Installer plugin to upgrade DAP to v5.0 and LiveLinks to v2.0. => Download LiveLinks v2.0 zip file from the members’ area on our site, unzip it and upload it to the WP plugins folder on your site (/wp-content/plugins) overwriting the existing DAP-WP-LiveLinks folder. => Download DAP v5.0 zip file from the members’ area on our site, unzip it and upload it to the root folder on your site overwriting the existing contents of “dap” folder. Install the new DAP v5.0 BETA & LiveLinks v2.0. You can use the DAP Easy Installer plugin (or use regular FTP) to install DAP. => Mobile-Responsive pages for User Profile, Affiliate Info, User Cancellation, Billing/Invoice etc. We have consistently updated DAP and delivered new features to provide you with all the tools you need to meet the changing needs of the marketplace, and to run a successful and profitable membership site! Please be sure to watch the video above to see what DAP v5.0 is all about, and do leave us a comment behind! P.S. It would be amazing if you could leave us a comment below and let us know what you think. Cheers! It’s just proof that DAP has constantly evolved. It has stayed relevant and successful in an industry crowded with plugins that are focused on selling more but fall short on the vision, the commitment and support. Membership plugins are support intensive. That’s why very few membership plugins survive beyond a year or two. It requires sustained passion and commitment to serve the customers, and also constantly improve the software. We have consistently upgraded DAP and delivered new features to provide DAP users with all the tools and help they need to meet the changing needs of the marketplace, and to run a successful and profitable membership site! We released a self-help/troubleshooting tool called ‘DAP Doctor‘ exactly a year ago (Oct 2014). 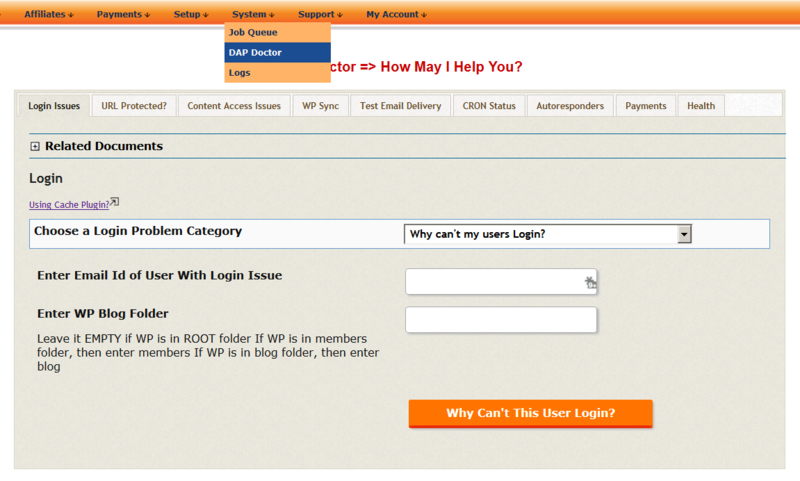 It makes troubleshooting of membership site issues like login, content access, WP sync – a breeze! We have now decided to make it FREE for all DAP users (your access to DAP upgrades & support must be current). (NOTE: We have also released DAP 4.9.2 today. Keep reading below for more details). Receive a HUGE discount on your DAP Support/Upgrade renewals! This offer is ONLY available for 3 days (Oct 10 – Oct 12, 2015). Take advantage of this crazy offer before it’s gone! The BIG DAP 5.0 Release – Here’s a SNEAK PEEK! DAP v4.9.2 is NOW available for download. There’s never been a better time to create a membership site and there’s never been a more powerful membership plugin than DAP! We are very thankful that you continue to place your trust in us and remain a part of the DAP family! We will continue to work very hard to help you achieve greater success with DAP! Please watch the video above to see what’s coming in DAP v5.0, and do leave us a comment behind – it would make our birthday that much more special if you do! Issue: If Xenforo account already exists, the DAP call to Xenforo fails. 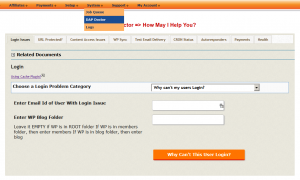 Fix: Update usergroup in Xenforo – even if account already exists. Issue: Timing issue between Clickbank INS and autologin results in users receiving an additional month’s access upon automatic login. Fix: Access only extended after a successful payment. Fix: Users will only receive access after a successful payment. Issue: Timing issue between JVZoo IPN and JVZoo autologin process results in users receiving an additional month’s access upon automatic login. Fix: Access only extended ONCE after a successful purchase. Download DAP v4.9.2 and LiveLinks v1.12.1 zip files from your members’ area on our site. a) You can use the DAP Easy Installer plugin to upgrade DAP to v4.9.2 and LiveLinks to v1.12.1. b) You can use FTP to manually upload the files. Install the new DAP v4.9.2 BETA & LiveLinks v1.12.1. You can use the DAP Easy Installer plugin (or use regular FTP) to install DAP. If you don’t wish to do the upgrade yourself, you may purchase our Installation & Upgrade service, and we’ll upgrade both DAP & LiveLinks on your site. This new version of DAP v4.9.2 and LiveLinks v1.12.1 is free for all Dappers with current upgrades & support. DAP v4.9.1 Beta is now available for download! This release includes a much improved integration with ClickBank (CB)! We have included a new Automatic-Login Link Generator for CB that will automatically log in your buyers to the member’s area after completing their purchase on ClickBank. They don’t have to wait for a welcome email (with their log-in credentials) to access the content. If you use ClickBank to sell, this is a *Must Watch* video! Overall, 4.9 has turned out to be a very stable release with no issues reported so far by the users who upgraded to 4.9 beta. We look forward to making this 4.9.1 release Final in the next couple of weeks as we can’t wait to unleash the BIG DAP 5.0! And that is going to be loaded with awesome features that will make DAP even more user-friendly and easy to use! Download DAP v4.9.1 and LiveLinks v1.12 zip files from your members’ area on our site. If you are already have LiveLinks v1.12, no need to upgrade LiveLinks. Just upgrade DAP to 4.9.1.
a) You can use the DAP Easy Installer plugin to upgrade DAP to v4.9.1 and LiveLinks to v1.12. b) You can use FTP to upload the files. Install the new DAP v4.9.1 BETA & LiveLinks v1.12. You can use the DAP Easy Installer plugin (or use regular FTP) to install DAP. This new version of DAP v4.9.1 and LiveLinks v1.12 is free for all Dappers with current upgrades & support.